After the energy crisis in the 1970s, many developed nations real-ized that emphasis needed to be placed on energy conservation and the preservation of our natural resources. While this issue is important on a global level, conservation is important on an indi-vidual and household level too. This realization prompted the de-velopment of energy efficient household products starting in the 1980’s. Nearly four decades later, consumers have really caught on. Energy efficiency is now an expectation in the market, and the standards keep improving. Focusing on making your home more energy efficient is not only great for the environment, it’s also great for household budgets. By utilizing products like honeycomb shades designed to slow down heat transfer, along with other en-ergy saving habits that complement these products, you’ll greatly cut your home energy bills. Hunter Douglas designed the first honeycomb shade in 1985, called Duette®. This window treatment was unique in that it was constructed from layers of individual cells that would trap cold or hot air coming into a home from the window and prevent it from impacting the temperature inside. While Duette® has been re-designed many times since its debut more than three decades ago, it remains the gold standard of energy efficient window treat-ments. Now with the newly redesigned Duette®, you can select the size and thickness of cell layers to suit your home’s insulation needs. 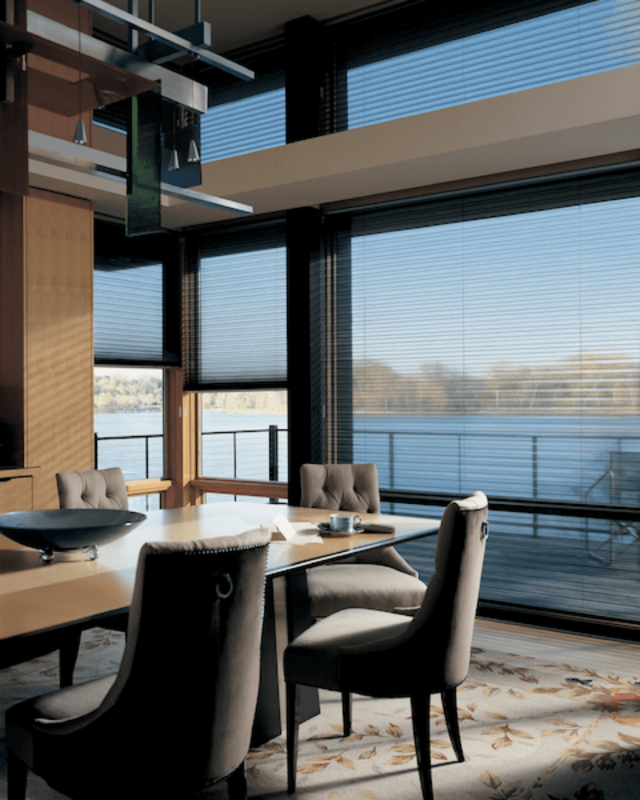 In addition to choices for cell size and thickness, you can select virtually any fabric for your honeycomb shades. It’s important to consider the window before selecting a fabric. For example, if you have a window that receives a good amount of direct sunlight, es-pecially in the summer, you may want to consider a light blocking or light reflecting fabric. This will greatly reduce the amount of heat coming inside off the window and reduce the workload of your air conditioning system. Hunter Douglas Honeycomb Shades are available with the Top Down/Bottom Up configuration. This is perfect for situations where privacy and the need for natural light are both important. This configuration allows you to close the bottom half of your win-dow, preserving your privacy, while leaving the top half of the win-dow open, allowing natural light to stream in. This configuration is ideal for bathrooms and bedrooms. Duette® Honeycomb Shades are available in the Vertiglide™ op-erating system that allows the shades to hang and operate verti-cally instead of just horizontally. This is ideal for covering sliding glass doors, giving you insulation on your doors as well as your windows while allowing you to have full use of the door. Contact the knowledgeable team at A Shade Above today. With over 20 years of experience, our professional staff members are experts when it comes to energy efficiency and window fashion design. Call us or stop by one of our two state-of-the-art show-rooms, conveniently located in Charlotte and Cornelius, NC. We proudly serve the entire greater Charlotte area. Contact us today to get started!